Each person has $50 of initial wealth. A coin toss game is offered to each person at a casino where the player can win or lose $50. Each player can flip a coin and if they flip heads, they receive $50. If they flip tails then they will lose $50. Which of the following statements is NOT correct? 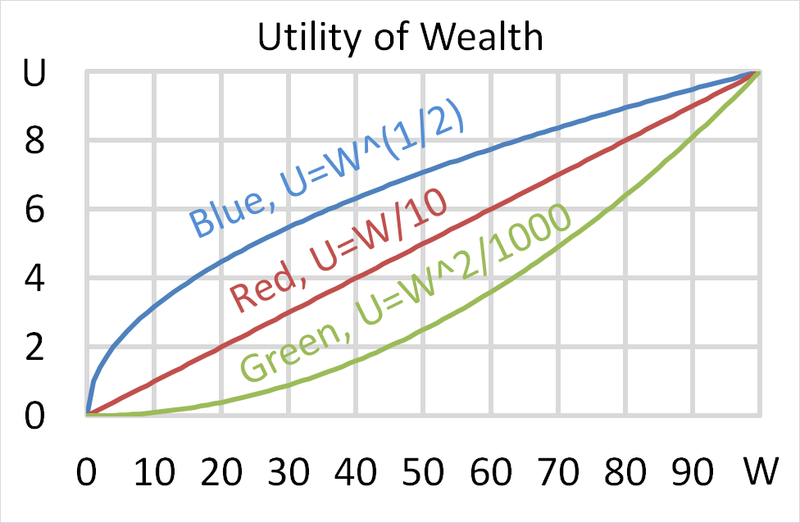 (a) Mr Blue's expected utility of wealth from gambling is 5 while refusing is 7.07. So the gamble makes him less happy. (b) Mrs Green's expected utility of wealth from gambling is 7.07 while refusing is 5. So the gamble makes her more happy. (c) Mr Blue's certainty equivalent of the risky gamble is $25. This is less than his current wealth of $50 which is why he would refuse. (d) Miss Red's certainty equivalent of the risky gamble is $50. This is equal to her current wealth of $50 which is why she is indifferent to gambling or not. (e) Mrs Green's certainty equivalent of the risky gamble is $70.71. This is more than her current wealth of $50 which is why she would accept.